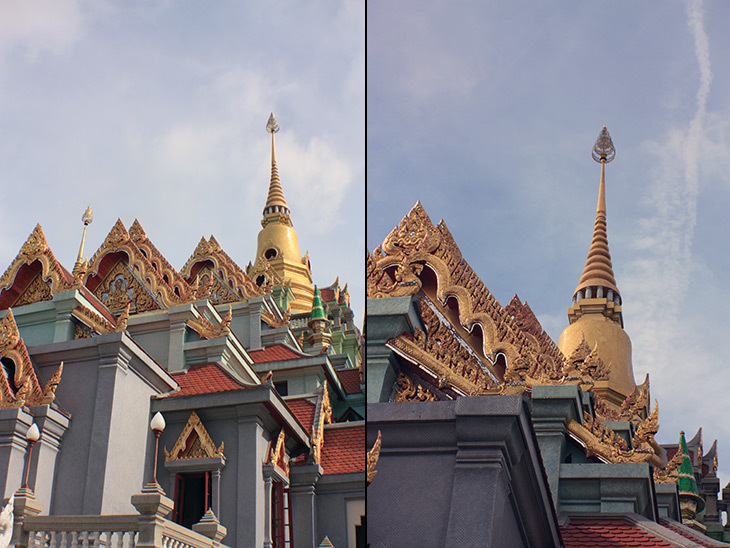 …Phra Mahathat Chedi Phakdi Prakat. Well; that’s easy for you to say! So, I chose not to delay my departure from the Malai-Asia Resort in Tab Sakae. There wasn’t anything to do other than look at a gloomy beach scene. I probably should explain that in this part of the world “Resort” is synonymous with “Hotel.” It doesn’t mean there’s a wide range of activities. Just rooms and a restaurant, and not always the latter. So, I browsed the web while waiting for the restaurant to open. When it did, I had to chuckle. My plate of eggs and sausages arrived with the ordered coffee, but immediately the waitress started bringing more and more items, until the table was almost completely covered. Ketchup, chili sauce, flavor enhancer, various bottles with writing I couldn’t decipher, toast, jam, butter, bottle of water, glass with ice, and so the list went on. In fact, everything you could think of except sugar for my coffee. I was back on the road shortly after 7:30am heading for that tongue-twister place mentioned above. It was only about 12kms south. 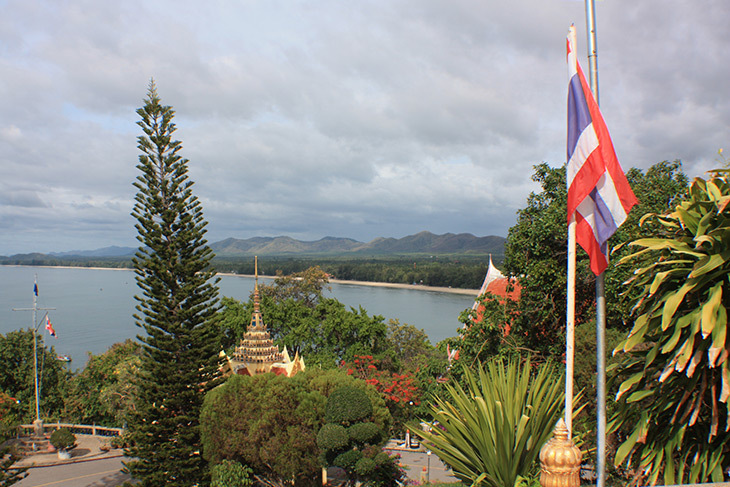 The chedi and wat are on something called Tongchai Hill. 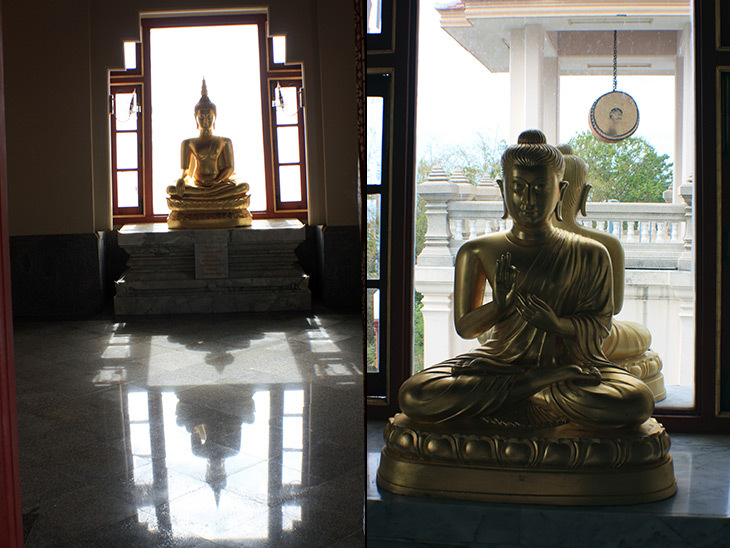 Luckily there’s a narrow winding road leading to the sea-facing Buddha statue. He certainly has a great view. 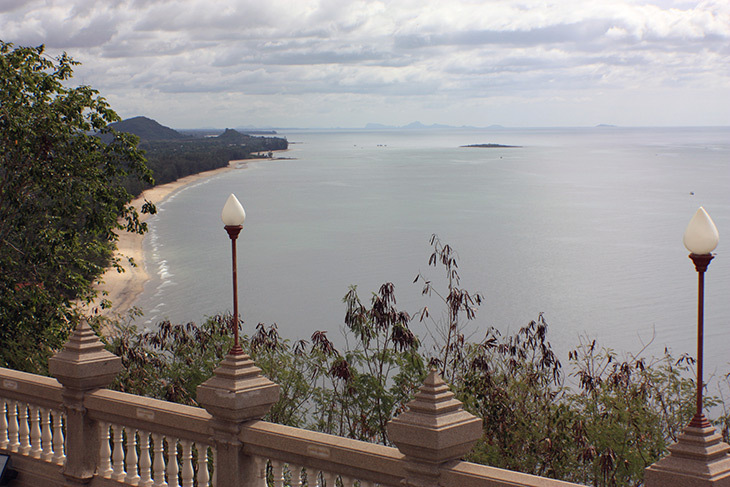 The hill sticks out into the sea, so there are beach views both north and south, covering the areas from Bang Saphan to Chumphon. There’s probably a geological word for a hill sticking into the sea. If you know the answer, please post it in the comments box at the bottom. Then we’ll all be wiser. 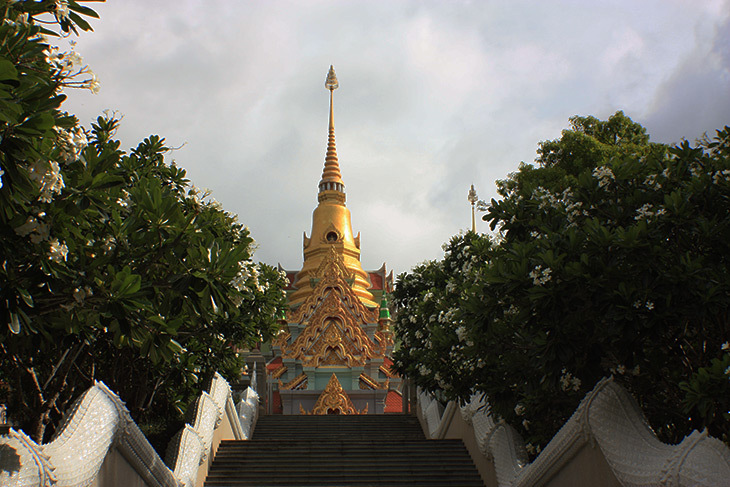 From there, it’s necessary to climb about a hundred steps to reach the impressive Phra Mahathat Chedi Phakdi Prakat stupa. 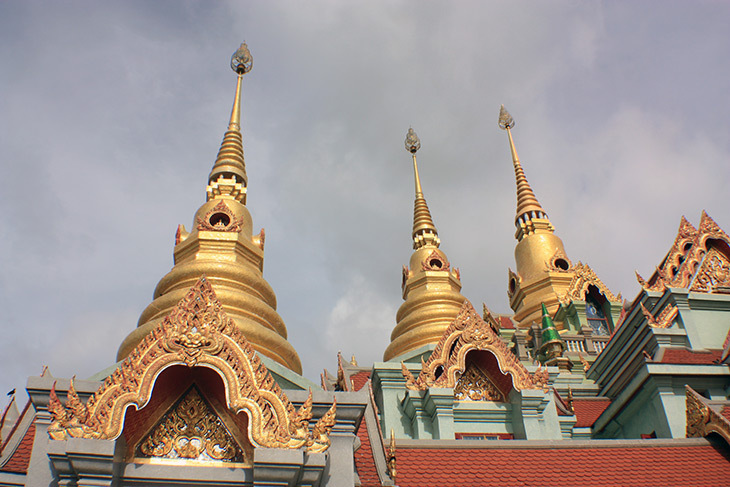 I have to cheat a little here and copy from another blog, to tell you “Phra Mahathat Chedi Phakdi Prakat was built for Rama IX golden jubilee to celebrate the 50th birthday of Rama IX being King of Thailand.” Which, unless you are Thai, tells you nothing at all about when it was built. Rama IX, the ninth monarch of the Chakri Dynasty, is the much revered Bhumibol Adulyadej, the present King of Thailand. Now, I think what the other blog means by “50th birthday of Rama IX being King of Thailand” is the 50th anniversary. 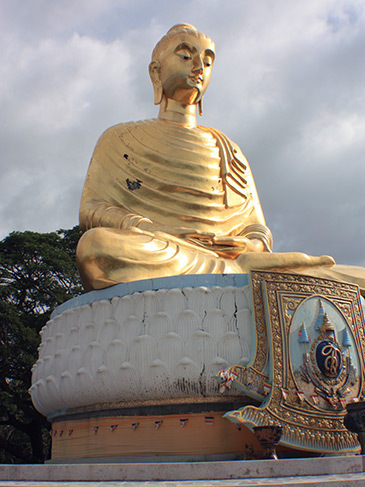 Given that HRH has reigned since 1946, that means the stupa was finished in 1996. I’m glad we’ve figured that out. It certainly looks new-ish. Inside the main building there are all kinds of scrolls, statues, stained glass and paintings, that are very impressive, but are not allowed to be photographed. Probably if you are Buddhist, you could spend hours at this place. But about forty minutes was enough for me. With a little sunshine, the beach scenes would have looked nicer, but clearly this was going to be a wet day, so I headed back to the main expressway to continue south. The rest of the morning was spent negotiating the construction zones, peering through torrential rain to figure out where the road was, and cursing the umpteen police road blocks. But I was home by 2:30pm, well ahead of my predicted 5pm. I always enjoy arriving home after a trip. I can cook my kind of food, which means – curry. No one in Thailand makes a good Malaysian-style kari ayam so I have to do it myself. It’s been hard work, but worth it. After I’ve relaxed for a few days, I’ll get withdrawal symptoms, and start to think “Where next?” I have ideas. Stay tuned.